TORO ELECTRIC VALVE EZ-FLO PLUS MALE 1'' A/C. SIMPLE: EZ-Flo Plus threaded-bonnet design makes servicing fast and easy. 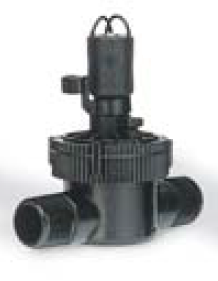 It allows you to reach internal parts without removing the valve from the system. Also, no tools are needed to remove the cap, minimizing lost parts during repairs. Flow Range 1” (25mm): 1 - 114 LPM. Operating Pressure 0,7 - 10 Bar. Dimensions: 130mm H x 75mm W x 140mm L.